A day late because, I don’t know really. Kind of ridiculous when this series is usually my only contribution to my own blog each week. 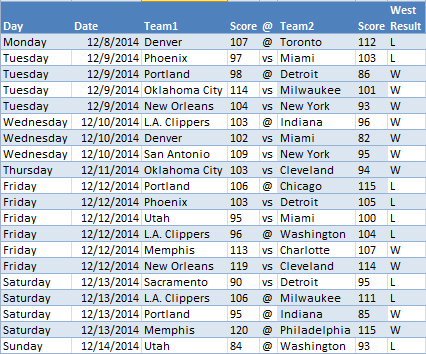 Lots of Clippers, Jazz, Suns, and Timberwolves in Week 8, playing in 13 of the 22 non-conference games. For the East, Indiana and Milwaukee are in four games each. Both played in one last night. FUN STUFF. So after this week there will be over 150 non-conference games. 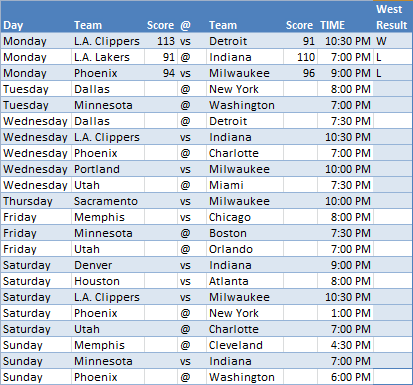 Will try to make next week a bit more interesting now that there’s a decent sample of games already played.